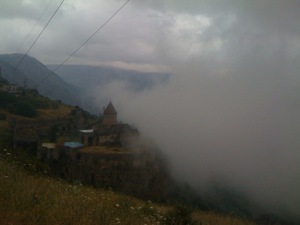 … and now since we’ve arrived… Tatev is my new favorite tourist destination! Not only did we drive through the world’s most exciting (and notably motion sickness-inducing) roads, but I actually touched a cloud. It’s disappointing that only 20% of Armenia’s tourists visit the spot. It probably (or more likely, obviously) has something to do with the roads. Our driver was a little old man from Goris who had spent 35 years just driving back and forth from Goris to Tatev. I felt more in touch with the locals in the city than I have anywhere else so far.